Not sure if real estate email marketing can help your real estate business? Find out the top five ways it can! 88 percent of home buyers say they would use their agent again or recommend their agent to others, according to NAR. That makes maintaining a relationship with past customers a top priority for the health of your real estate business. However, since ten or more years can elapse between home purchases, you need a way to stay in touch with past customers without being intrusive. Research has shown that more than 70 percent of people prefer companies to communicate with them through email (MarketingSherpa). A real estate email newsletter gives you a way to maintain a relationship with customers without seeming pushy or annoying. When it is time to purchase another property, your clients can easily get in touch with you. Referrals remain the top way that most people find a real estate agent, according to a 2017 survey by NAR. The typical home seller has recommended their agent two times since selling their home, and thirty-three percent of sellers have recommended their agent three or more times. Real estate emails are a great way to remain “top of mind” with clients so they think of you when their friends, family, or acquaintances need an agent. And because emails can be forwarded with just a few clicks, sending out a monthly email ensures that your clients always have a convenient way to pass on your contact information to interested parties. When home buyers are searching for a real estate agent, they look for someone with a good reputation, who is trustworthy and knowledgeable about local neighborhoods, according to the National Association of Realtors’ 2017 report on Home Buyer and Seller Generational Trends. Sending out real estate emails that keep your clients apprised of real estate matters helps to demonstrate your competence. Share information on local properties, explain financial matters and real estate trends, and pass on ‘insider knowledge’ about community happenings in the local neighborhood. This will help establish you as an industry authority, someone that homebuyers and sellers can rely on to have the professional knowledge and expertise to look after their interests. With so many real estate professionals on the market, agents need to establish a strong personal brand if they want to succeed. Email is a powerful reinforcement tool that will go a long way towards building your real estate brand. When you send real estate emails to clients with your distinctive logo, font, and photo prominently displayed, it reinforces your personal brand and helps your real estate agency stand out in customers’ minds. Whether you are an independent realtor or part of a large real estate agency, you need to make the most of your marketing budget. Email has one of the best returns on marketing spend of paid online marketing methods. 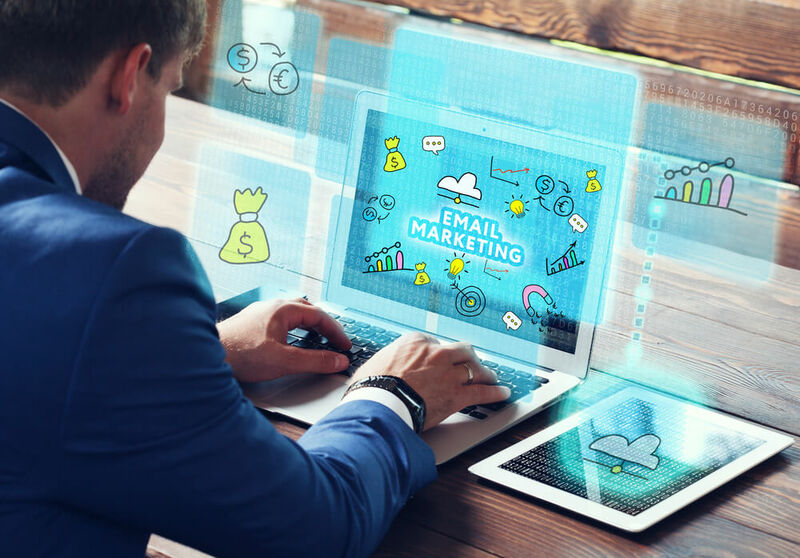 A 2016 survey by eMarketer found that the median ROI of email was an incredible 122 percent – more than four times higher than any other marketing format they examined, including paid search, social media, and direct mail! If you would like some help coming up with real estate email marketing ideas or prefer to have someone handle all your real estate email marketing chores for you, call For Sale Marketing. Our dedicated real estate marketing agency can provide you with everything you need to develop a successful real estate email marketing strategy including professional email writing services, dedicated landing pages, branding packages, and much more. Contact us at For Sale Marketing today at 954-866-1115 for help developing a real estate email marketing strategy to ensure your real estate agency’s success!